WASHINGTON HEIGTHS — A popular local book shop is asking Uptown residents to donate their bucks for books. Word Up, the book store run by a volunteer-run collective, is hoping to raise $25,000 through an IndieGoGo campaign that launched Monday to expand the shop’s Spanish-language and youth-oriented inventory and programming. “Now that we have a home, we want to grow and develop in ways that best allow for full participation from everyone in our neighborhood,” the volunteers who run the shop wrote on the fundraising page. 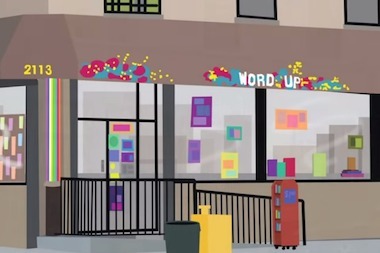 Word Up started as a one-month pop-up shop during the 2011 Uptown Art Stroll. After months of operating for free and, later, at a reduced rent at its original location, Word Up lost its home in 2012 when a new landlord took over the space. Organizers then raised $60,000 through an earlier IndieGoGo campaign to find the shop a new home, and it reopened in that location at 2113 Amsterdam Ave. in July 2013. Since then, Word Up has continued to act as a bookstore and a community center, offering programs that include a teen theater workshop, Spanish-language creative writing classes, tutoring and readings, and performances by local artists. However, Word Up volunteers feel they could be doing more to serve two of the largest populations in the community. The volunteers pointed out that more than 100,000 Spanish-speaking people live in Washington Heights, but said there are relatively few places in New York City to find Spanish-language books. “We have worked hard to build our Spanish-language section, but to make the bookshop truly bilingual, we need a wider range of books in Spanish at affordable prices,” the fundraising page said. In addition, Word Up would like to offer more to young people living in the community, especially considering that almost a quarter of the population is under the age of 20, according to Community Board 12 records. Word Up volunteers did not immediately respond to requests for comment. If they meet their fundraising goal, the store's volunteers plan to triple their Spanish-language book inventory, redesign the children’s section of the shop, develop new writing and performance programs for youth, and add more Spanish-language events to their calendar, they said on the fundraising page. The campaign had already raised nearly $7,000 by Tuesday afternoon since launching the previous day. Word Up also has a chance to win a $5,000 grant from GivKwik, a fundraising website, in honor of Giving Tuesday. In order for Word Up to win, they must earn the most votes from the public. If they exceed their $25,000 goal, the fundraising organizers will put the money toward other needs at Word Up. “Your donation will help Word Up progress toward the ultimate goal — to remain a resource for our diverse community for future generations,” the volunteers wrote.